Asiedu Attobrah has been one of the revelations of the GLO Premier League 2011-2012. Attobrah, a hard-working midfielder, has just finished his fourth season at New Edubiase United FC, a rather modest side that became number five in the league. My first record of Attobrah is from the Division One League 2008-2009, the second level of Ghanaian football. In August 2009, Attobrah was part of the team that won promotion to the GLO Premier League 2009-2010. Attobrah made few headlines during his first season at top level. The following season, the GLO Premier League 2010-2011, proved to be a breakthrough season for Attobrah. Attobrah became an established member of the first team and forced his way into the squad of the Ghana U-17 national football team, the so-called Black Starlets. Attobrah did not score any league goals during the season. His first ever league goal was scored on 18.12.2011, in Week 12 of the GLO Premier League 2011-2012. Attobrah became a key player for New Edubiase United FC during the season, playing regularly, scoring a total of three league goals and even captaining the side in some matches. Attobrah managed several assists during the season, which benefited top striker Emmanuel Baffour, the leading scorer in the GLO Premier League 2011-2011 with 21 goals. In May 2012, Attobrah was included in the squad of the Ghana B national football team. Apparently, Attobrah also participated in training sessions with the Ghana U-20 national football during the season. He is not an established member of any national football team at the time of writing. According to unconfirmed sources, Attobrah is born 15.03.1995. If this is correct, Attobrah was actually 14 years old when he played first team football for New Edubiase United FC. Attobrah is often found in central midfield or on the right-side of the midfield. He can also play on both wings or as an classical attacking midfielder / playmaker. His work-rate, agressiveness and discipline is truly impressive. Attobrah is the kind of player that never takes a rest. Attobrah also possesses creativity and intelligence. He is known for dictating the pace of the game, knowing exactly when to pass and when to hold up the ball. In fact, Attobrah is pretty much a complete midfield architect. 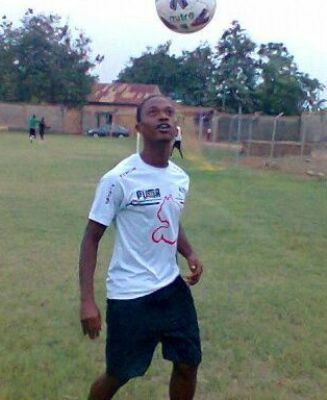 In May 2012, Attobrah was linked to league champions Asante Kotoko FC. It seems likely that Attobrah will join a better club during the summer. The name of Attobrah is often misspelled as “Asiedu Atobrah”, “Asiedu Attobra” or “Asiedu Attorbrah”. The picture was found on Ghanasoccernet.